This optimistic little Cocker Spaniel is always moving on up. Jennifer, the volunteer who’s looking after him, says: “He can jump up onto our garden sleepers, and he’s also starting to master getting up and down stairs. He adores the window cleaner – we suspect he wants to climb his ladder!” His adventuresome spirit is matched only by his clumsiness. Jennifer laughs: “Tyson doesn’t understand the concept of straight lines yet. We are never on the same side of a telegraph pole. How is that possible?” It’s possible because he’s a puppy! One day, Tyson will help a deaf person leave loneliness behind. Until then, it’s another cute detail about this cute Cocker Spaniel. How did we shoehorn so much character into such a small puppy? Will Tyson always be like a bull in a china shop (albeit a very soft, cuddly bull)? Will the window cleaner become his bestest friend? Sponsor Tyson today and find out! Tyson is a Cocker Spaniel, a breed that makes great hearing dogs because they’re very intelligent and loyal. It takes about 18 months to train a hearing dog like Tyson. 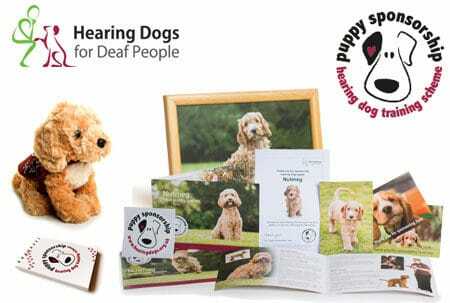 The Hearing Dogs charity receives no government funding to do this, so every sponsorship is incredibly valuable. Hi, I’m Tyson! I’m a cuddly Cocker Spaniel, who is always climbing, up and up… but then I’m so clumsy I fall down! I want to help a deaf person lead the full life they deserve. Will you sponsor me, and help me do this?